First Choice Gutters and Siding excels at finding you the perfect gutters for your home’s water management system. We provide gutter installation, gutter repair, and gutter cleaning services to the Omaha area. We offer free estimates, and our technicians’ professionalism and experience will make sure the process is completely stress-free for you. 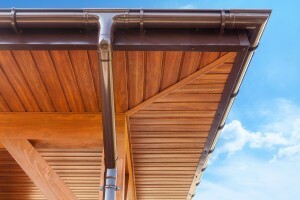 First Choice can tailor your new custom gutters to your home’s functional and aesthetic needs. We can install gutters made from copper, steel, and aluminum depending on your preference. In addition to gutter installation, we also offer gutter cover installation services as well as “chop and drop” service. First Choice is always happy to work with you based on your individual preferences. To best suit the needs of our customers, we also offer “chop and drop service” for those who don’t need complete gutter installation services. The chop and drop process involves us cutting the gutters to the correct size and specifications needed for your Omaha home, and then dropping them off for you to install at your own convenience. If you’re a Do-It-Yourself type of homeowner, chop and drop service is the right option for you. Are you looking for a more traditional gutter for your historic home or just looking to find the right fit for your more traditional sense of style? We offer half-round gutters in copper and steel. We will work closely with you to make sure your new gutters fulfill modern water management techniques while still maintaining your home’s unique style. Eliminate the messy, time-consuming, and sometimes dangerous job of cleaning out your Omaha area home’s gutters with custom gutter covers from First Choice Gutters and Siding. Gutter covers attach securely to your existing gutters to permanently protect your gutters from leaves, rodents, ice, and debris. First Choice provides fast and efficient gutter cover installation to make sure your home’s water management system is working at its best. Gutter covers help make sure your home’s water management system is working properly. Gutters have the important job of protecting your home from rainwater, snow, and ice. When gutter covers keep debris from your gutters, the gutters protect your foundation, deck, and landscaping from damage. They also protect from mosquito and other infestations. With the variety of gutter products available at First Choice, protecting your Omaha-area home from water damage and other problems has never been easier. Fill out our contact form or call First Choice Gutters and Siding at (402) 498-9300 today to get started with the gutter installation, gutter repair, or gutter replacement process for your Omaha-area home!